Aquatech Amsterdam donates the registration fees received from entrants to the Aquatech Innovation Award to AMREF Flying Doctors. A line-up of 14 innovative technologies, most of them world firsts, have been selected by an expert jury from a record number of entries to this year’s Aquatech Innovation Award. The winner will be revealed at the opening ceremony of the Amsterdam International Water Week and the Aquatech Amsterdam exhibition on 30 October. Entries to the award were submitted across five categories. The jury identified nominees from each category to be considered as candidates for the overall prize. The nominees have been chosen from entries representing increasingly diverse technologies. ‘The water technology field normally focuses on areas such as biology and chemistry,’ says Buisman. ‘One entrant uses space technology to look for water leakage on Earth – that surprised us in the jury. We saw more entries reflecting the whole trend of big data and computerisation, which is entering the sector slowly but surely,’ he adds. He notes also a trend towards reducing chemical use in wastewater treatment in order to achieve more sustainable solutions. 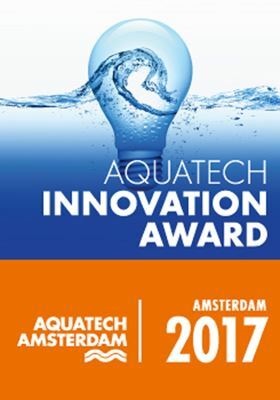 The Aquatech Innovation Award has five categories: Innovation – not yet to market; Process control technology & Process automation; Transport & storage; Waste water treatment; and Water treatment (drinking water, clean water, including point of use). The judging criteria are originality (50%), practicality (25%) and sustainability (25%). Information on all nominees can be found here. To ensure free entrance, visitors need to register online here.